This book goes beyond the traditional methods of power generation. It introduces the many recent innovations on the production of electricity and the way they play a major role in combating global warming and improving the efficiency of generation. It contains a strong analytical approach to underpin the theory of power plants—for those using conventional fuels, as well as those using renewable fuels—and looks at the problems from a unique environmental engineering perspective. The book also includes numerous worked examples and case studies to demonstrate the working principles of these systems. Conventional and Alternative Power Generation: Thermodynamics, Mitigation and Sustainability is divided into 8 chapters that comprehensively cover: thermodynamic systems; vapor power cycles, gas power cycles, combustion; control of particulates; carbon capture and storage; air pollution dispersal; and renewable energy and power plants. 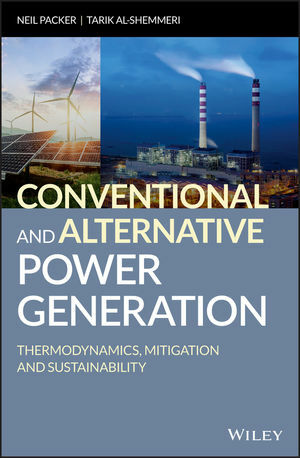 Conventional and Alternative Power Generation: Thermodynamics, Mitigation and Sustainability is an ideal text for courses on mechanical, chemical, and electrical engineering. NEIL PACKER is a Chartered engineer and Senior lecturer in Mechanical Engineering at Staffordshire University, UK. He has been teaching thermo-fluid and environmental engineering for over 20 years and has acted as an energy consultant in the UK, mainland Europe, and North Africa. TARIK AL-SHEMMERI, PHD, is Professor of Renewable Energy Technology at Staffordshire University, UK. He has lectured and researched extensively in the area of thermo-fluids, renewable energy, and power generation.